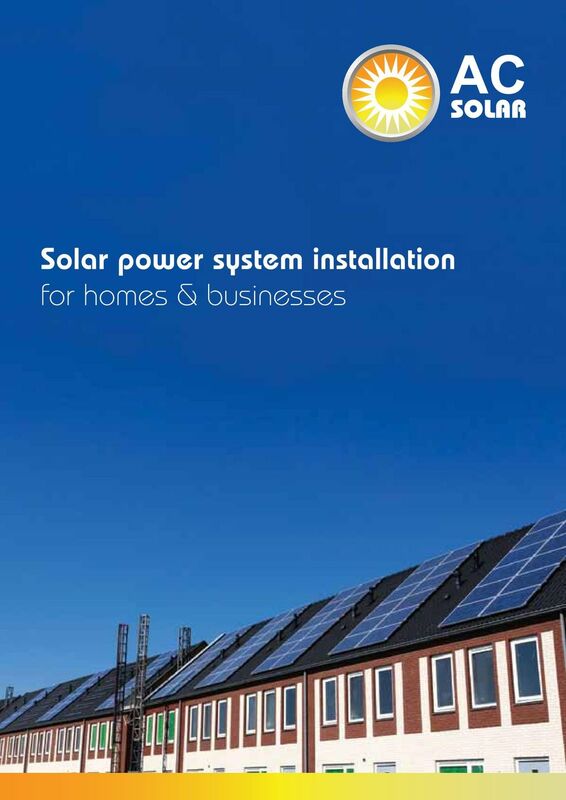 Download "Solar power system installation for homes & businesses"
2 02 For more information visit Welcome to AC Solar AC Solar is one of the UKs leading domestic Solar PV installers, with wide experience in the renewable energy industry installing both commercial and domestic scale installations. Our company was created to provide industry leading solar PV installations and consequently customer service is our passion and at the heart of everything we do, from the initial contact with our team to the final commissioning of your system. We are not tied to any one manufacturer and are keen to maintain the ability to match the right product to each application. 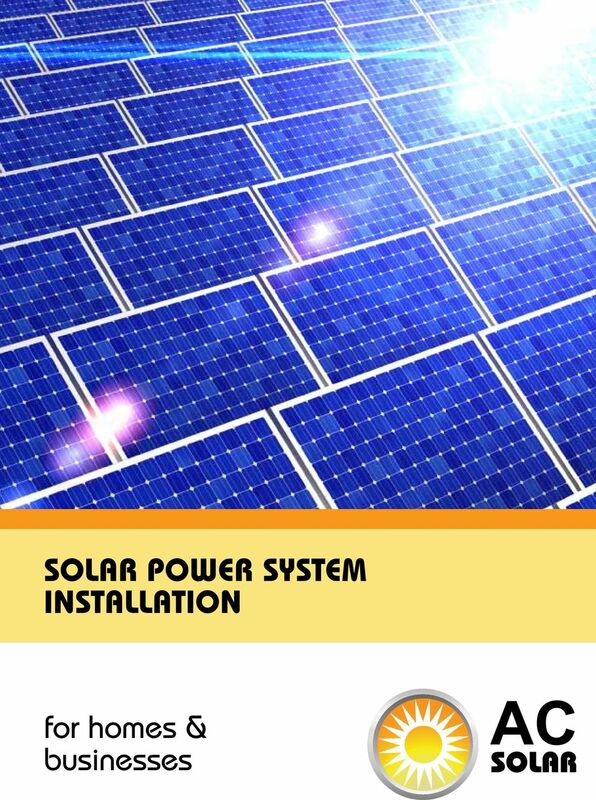 You will therefore find that we offer a range of solar panels and inverters. Each will have been chosen to meet a specific customer need, be it efficiency, aesthetics, cost or giving best value. Please read through the following pages and call us to arrange a quote. We pride ourselves in offering excellent value and excellent service and we guarantee you will not be disappointed in the service you receive. Why solar power? Firstly, generating your own energy at home reduces the strain on our aging electricity network and it reduces the need to build new power stations, albeit slightly. If you re reading this, you re also probably very aware of the issue of climate change which is now believed by the majority of the worlds scientists to be driven by increasing levels of carbon dioxide in the atmosphere. Solar PV is probably the single biggest change to your property you can make to reduce your carbon footprint. The main reason for installing solar PV is financial. Quite simply solar PV is one of the best investments that you can make right now. The cost has fallen significantly in recent years and you can receive payments for the energy you produce from the Feed in Tariff scheme for the next 20 years. 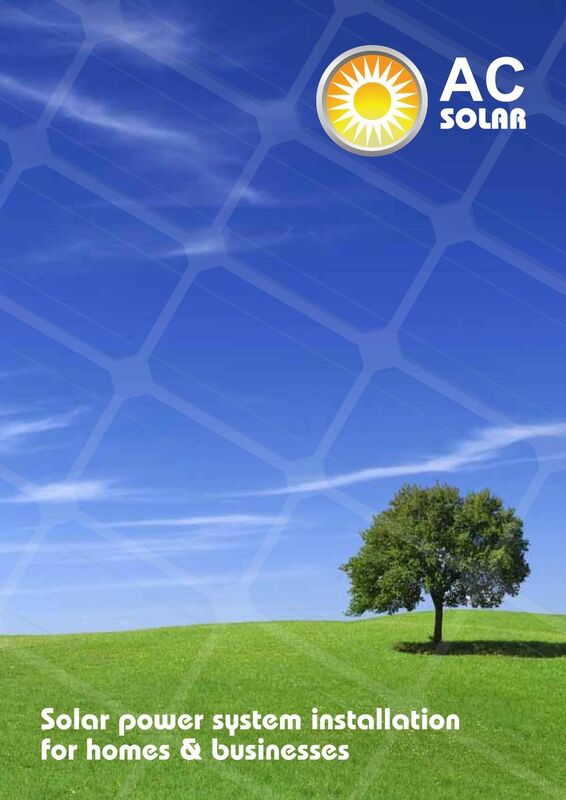 Solar PV saves energy, saves money and saves the environment. If you want to make money while the sun shines and feel good about it, then you need to fit Solar PV. 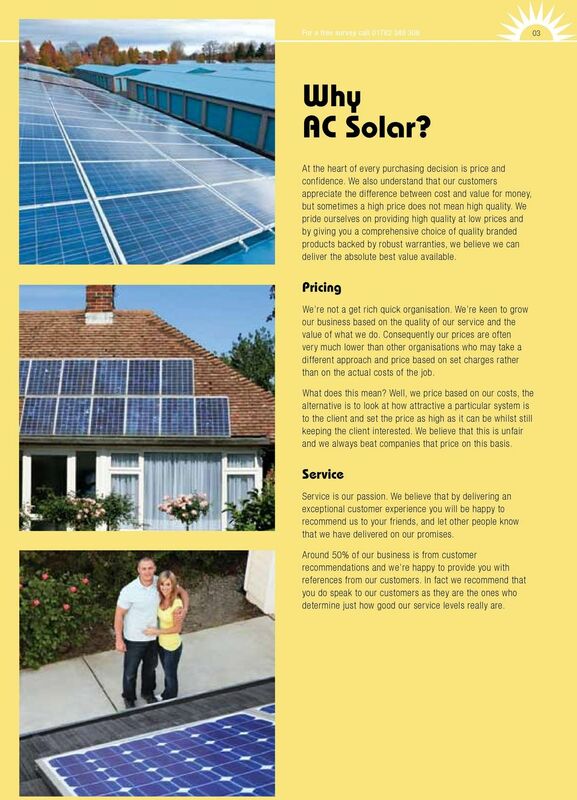 3 For a free survey call Why AC Solar? At the heart of every purchasing decision is price and confidence. We also understand that our customers appreciate the difference between cost and value for money, but sometimes a high price does not mean high quality. We pride ourselves on providing high quality at low prices and by giving you a comprehensive choice of quality branded products backed by robust warranties, we believe we can deliver the absolute best value available. Pricing We re not a get rich quick organisation. We re keen to grow our business based on the quality of our service and the value of what we do. Consequently our prices are often very much lower than other organisations who may take a different approach and price based on set charges rather than on the actual costs of the job. What does this mean? Well, we price based on our costs, the alternative is to look at how attractive a particular system is to the client and set the price as high as it can be whilst still keeping the client interested. We believe that this is unfair and we always beat companies that price on this basis. Service Service is our passion. We believe that by delivering an exceptional customer experience you will be happy to recommend us to your friends, and let other people know that we have delivered on our promises. Around 50% of our business is from customer recommendations and we re happy to provide you with references from our customers. In fact we recommend that you do speak to our customers as they are the ones who determine just how good our service levels really are. 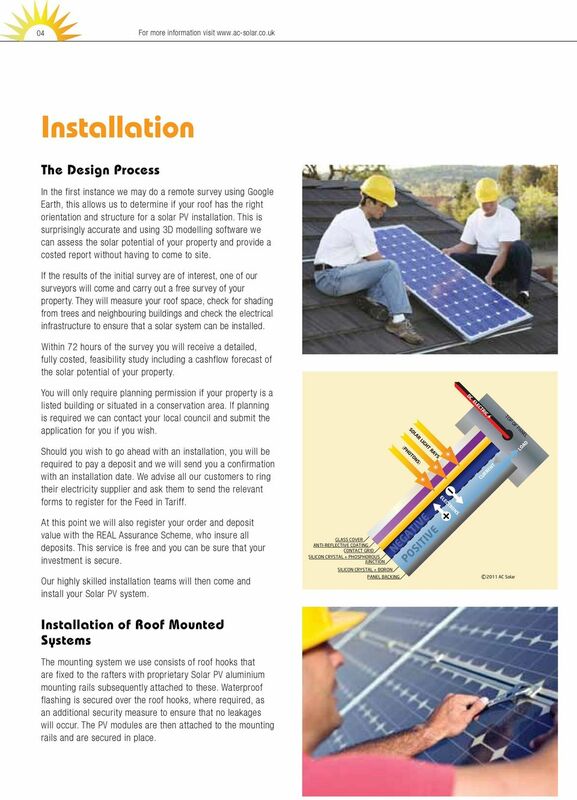 4 04 For more information visit Installation The Design Process In the first instance we may do a remote survey using Google Earth, this allows us to determine if your roof has the right orientation and structure for a solar PV installation. This is surprisingly accurate and using 3D modelling software we can assess the solar potential of your property and provide a costed report without having to come to site. If the results of the initial survey are of interest, one of our surveyors will come and carry out a free survey of your property. They will measure your roof space, check for shading from trees and neighbouring buildings and check the electrical infrastructure to ensure that a solar system can be installed. Within 72 hours of the survey you will receive a detailed, fully costed, feasibility study including a cashflow forecast of the solar potential of your property. You will only require planning permission if your property is a listed building or situated in a conservation area. If planning is required we can contact your local council and submit the application for you if you wish. DC ELECTRIC TOP OF PANEL Should you wish to go ahead with an installation, you will be required to pay a deposit and we will send you a confirmation with an installation date. We advise all our customers to ring their electricity supplier and ask them to send the relevant forms to register for the Feed in Tariff. SOLAR LIGHT RAYS (PHOTONS) ELECTRONS CURRENT LOAD At this point we will also register your order and deposit value with the REAL Assurance Scheme, who insure all deposits. This service is free and you can be sure that your investment is secure. GLASS COVER ANTI-REFLECTIVE COATING CONTACT GRID SILICON CRYSTAL + PHOSPHOROUS JUNCTION NEGATIVE POSITIVE SILICON CRYSTAL + BORON Our highly skilled installation teams will then come and install your Solar PV system. PANEL BACKING 2011 AC Solar Installation of Roof Mounted Systems The mounting system we use consists of roof hooks that are fixed to the rafters with proprietary Solar PV aluminium mounting rails subsequently attached to these. Waterproof flashing is secured over the roof hooks, where required, as an additional security measure to ensure that no leakages will occur. The PV modules are then attached to the mounting rails and are secured in place. 5 For a free survey call Electrical Installation The Solar PV modules are electrically connected by a single cable in series to form strings in a combination which is compatible with the chosen inverter. 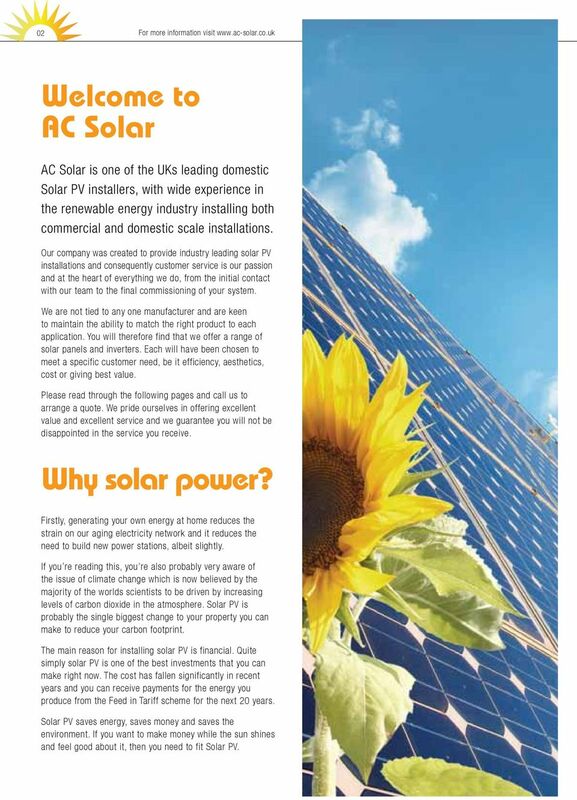 AC Solar will only install inverters certified as G83/1 compliant for use in the UK. The certification can be supplied if requested. Inverters are used to convert the DC power derived from the array into AC power suitable for parallel connection to the mains utility (230 Vac/ 50Hz). Inverters are usually installed alongside the DC and AC isolators in a suitable location (e.g. loft space, garage or meter cupboard). Access to the equipment is important for commissioning the system and there must be a 15-20cm gap around the inverter to allow air flow to the unit. Metering As part of your installation we will include an OFGEM approved Generation Meter. This meter is used to display the amount of kilowatt hours your Solar PV system has generated from the date of commissioning. 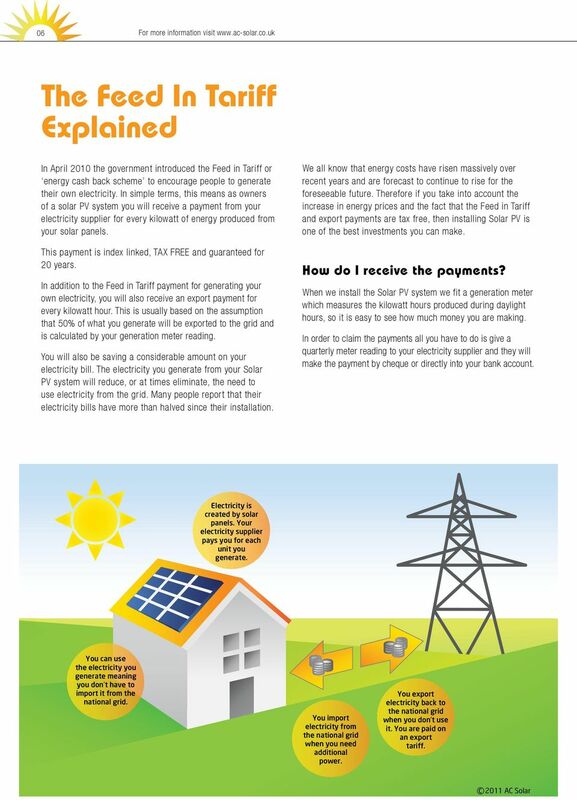 You will be required to provide your electricity supplier with a quarterly reading from this meter in order to claim your Feed in Tariff payments. The whole process will take from one to two days. The installation of the roof hooks, mounting rail and modules takes approximately one day, depending on what size system you have. The electrician will install the inverter and commission the system which usually takes one day. 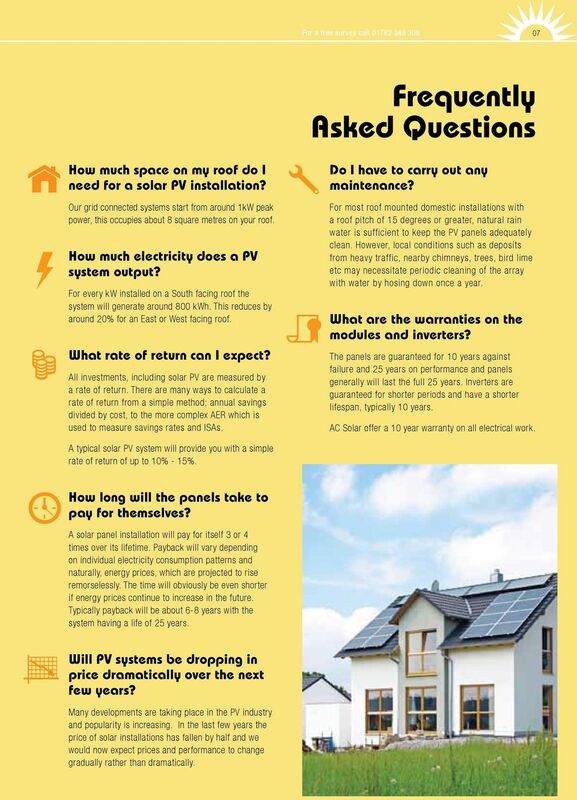 7 For a free survey call Frequently Asked Questions How much space on my roof do I need for a solar PV installation? Our grid connected systems start from around 1kW peak power, this occupies about 8 square metres on your roof. How much electricity does a PV system output? For every kw installed on a South facing roof the system will generate around 800 kwh. This reduces by around 20% for an East or West facing roof. What rate of return can I expect? All investments, including solar PV are measured by a rate of return. There are many ways to calculate a rate of return from a simple method; annual savings divided by cost, to the more complex AER which is used to measure savings rates and ISAs. Do I have to carry out any maintenance? For most roof mounted domestic installations with a roof pitch of 15 degrees or greater, natural rain water is sufficient to keep the PV panels adequately clean. However, local conditions such as deposits from heavy traffic, nearby chimneys, trees, bird lime etc may necessitate periodic cleaning of the array with water by hosing down once a year. What are the warranties on the modules and inverters? The panels are guaranteed for 10 years against failure and 25 years on performance and panels generally will last the full 25 years. Inverters are guaranteed for shorter periods and have a shorter lifespan, typically 10 years. 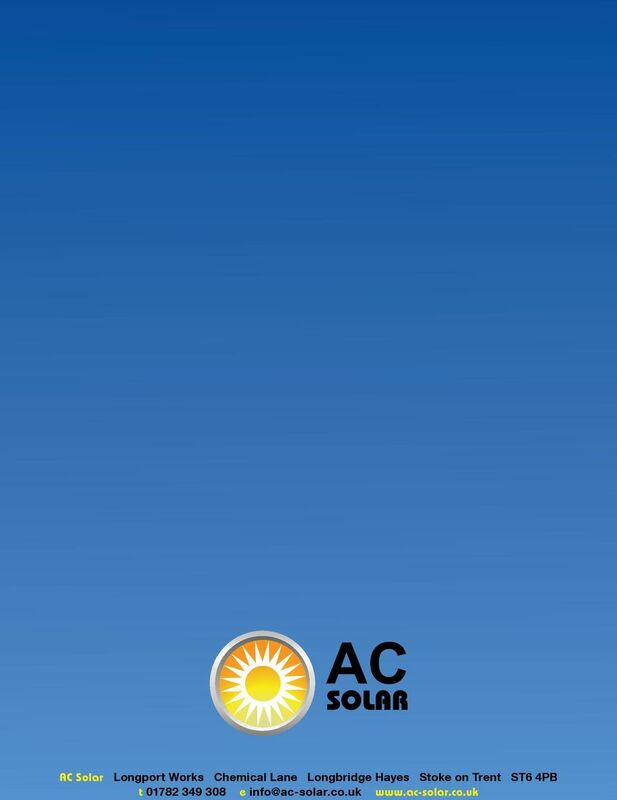 AC Solar offer a 10 year warranty on all electrical work. A typical solar PV system will provide you with a simple rate of return of up to 10% - 15%. How long will the panels take to pay for themselves? A solar panel installation will pay for itself 3 or 4 times over its lifetime. Payback will vary depending on individual electricity consumption patterns and naturally, energy prices, which are projected to rise remorselessly. The time will obviously be even shorter if energy prices continue to increase in the future. Typically payback will be about 6-8 years with the system having a life of 25 years. Will PV systems be dropping in price dramatically over the next few years? Many developments are taking place in the PV industry and popularity is increasing. In the last few years the price of solar installations has fallen by half and we would now expect prices and performance to change gradually rather than dramatically. We help businesses utilise the benefits of solar energy to reduce electricity costs. For Free. GUIDE ON HOW TO GET YOUR GRID CONNECTED SOLAR SYSTEM INSTALLED. 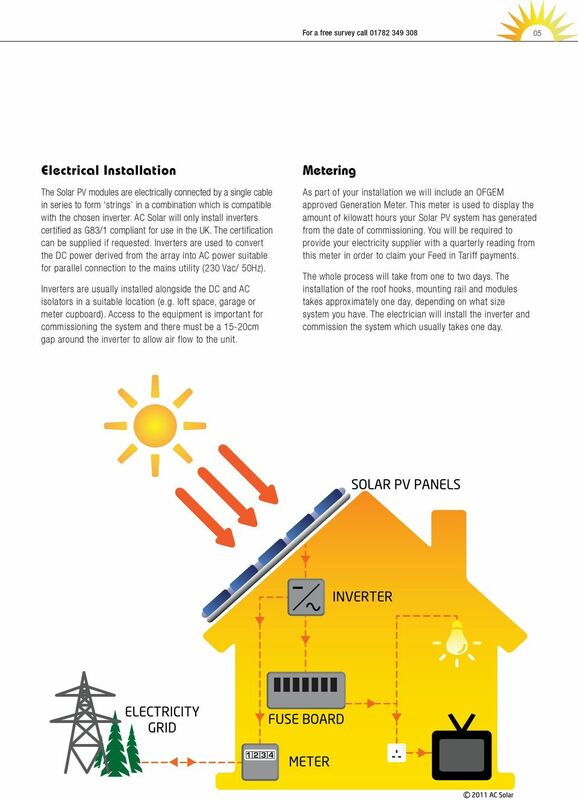 What is Solar Electricity? Siemens and The Carbon Trust The Free Money Deal. Free Money. Money doesn t grow on trees. But it does now grow on roofs and in boiler houses. Community Energy? 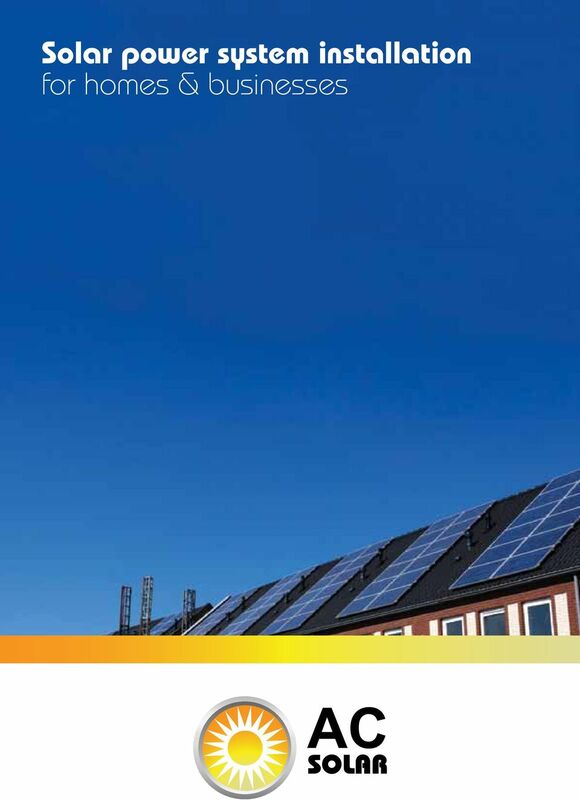 An evaluation of the business case for investing in Solar PV technology for civic and community buildings. A buyer s guide to renewable and low carbon technologies To find out more about installing renewable energy call 0800 512 012 or visit energysavingtrust.org.uk What are renewable and low carbon technologies? Listed are common requirements that apply to existing solar installations when altered, added to or reconfigured. The SunMizer SRS Advantage. Copyright 2013 Xandex Inc.